With the cables checked and the mausoleum complete, it was time to try running through the first 115m cable pair. This would go from the RF-container, through all the ducts and out to antenna tile location HXX (far western corner). 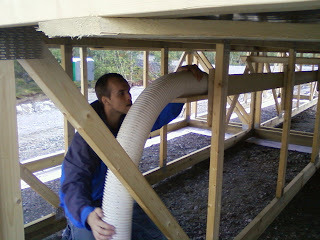 Ilkka Virtanen checks the ducting prior to the first cable-run attempt. We got the cable through the RF-container ducts, and then the first stretch from the mausoleum to the 'corner' before heading up to the array. However, the final stretch to the array was somehow blocked. We worked at it for a bit before recovering a loose piece of geotextile that was blocking the tube. However, the cable-pair still refused to go through. The draw string was working, and some checks with rope were also working. However using the 'lemming' didn't. 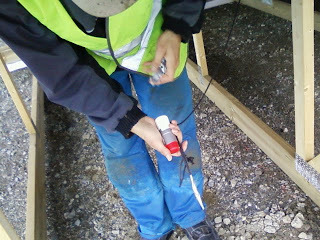 The 'lemming' is our nickname for an improvised test canister. It is attached to the draw-string loops and can be used to check that a cable duct is clear. The name is from the fact that a lemming is what would be best able to check on the duct situation. And this is the closest we can approximate to a lemming! Taping the 'lemming' to the draw-string for another reconnaissance mission! Well, it turned out that we had a serious blockage. We suspected that there might be a problem with one of the frameset anchors having pierced the duct pipe. However, a test excavation indicated that this was not the case. What we did find, however, was some seriously crimped pipework! As a result, we checked all the ducts and realised that there was just one stretch where two of the four pipes were blocked. So we excavated the entire area. 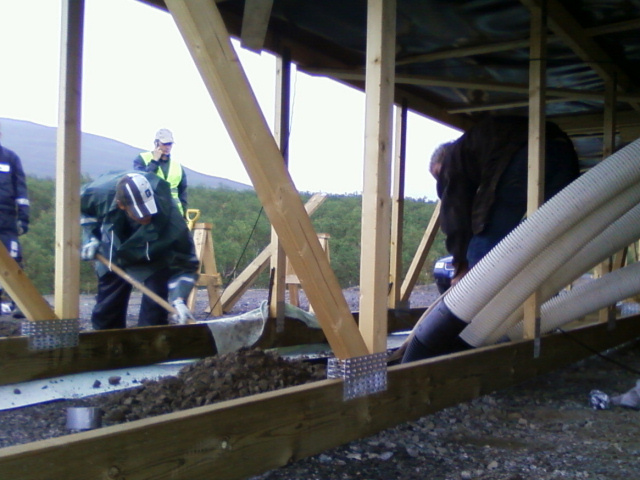 The team digs out the four-pipe run by the northern array corner. Sure enough, this is what we found. 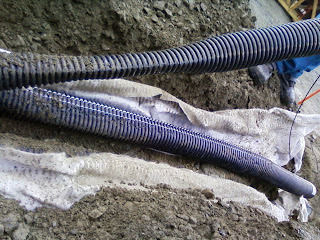 These crimped pipes are probably due to extreme ground pressure during the movement of vehicles overhead. 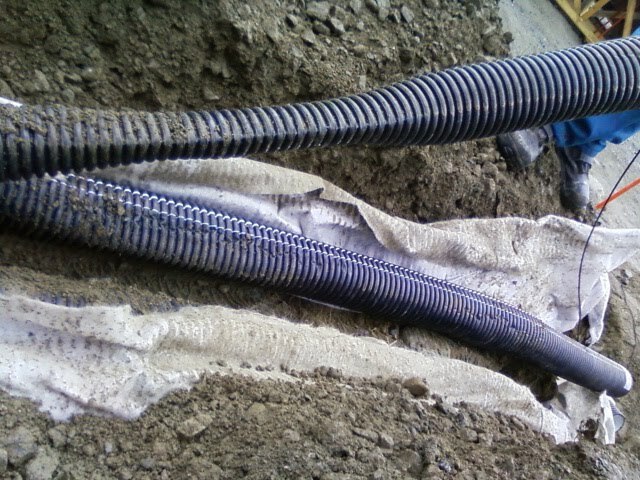 Well, we have no choice by the re-work the trench and put down new pipe. Image of the day... again!